Synthetic peptide corresponding to residues in Human UGT1A6 (UniProt P19224). Caco-2, fetal liver and A431 lysates; Human colon and liver tissues. Our Abpromise guarantee covers the use of ab157476 in the following tested applications. WB 1/1000 - 1/10000. Predicted molecular weight: 61 kDa. UDPGT is of major importance in the conjugation and subsequent elimination of potentially toxic xenobiotics and endogenous compounds. This isoform has specificity for phenols. 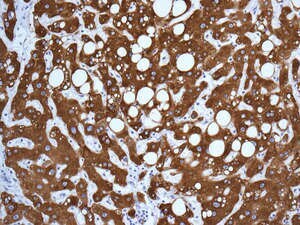 Expressed in skin, kidney and liver. Belongs to the UDP-glycosyltransferase family. 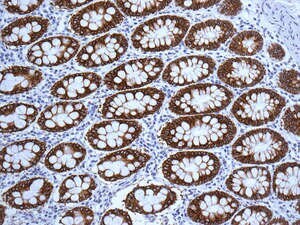 Immunohistochemical analysis of paraffin-embedded Human colon tissue labeling UGT1A6 with ab157476 at 1/250 dilution. 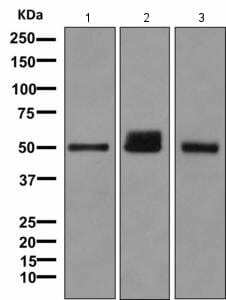 Immunohistochemical analysis of paraffin-embedded Human liver tissue labeling UGT1A6 with ab157476 at 1/250 dilution. ab157476 has not yet been referenced specifically in any publications. Publishing research using ab157476? Please let us know so that we can cite the reference in this datasheet. There are currently no Customer reviews or Questions for ab157476.